Written by Peter Conrad The airline Avianca-Taca and credit card company Credomatic opened a costa rica all inclusive deals lounge last night, with all the amenities for their VIP clients flying through the Juan Santamaria International Airport. The new space offers travelers the services of restaurant, bar, wireless internet and 20 screens that replicate the flight status and doors that must be addressed. The structure, 600 square meters, is on the third floor of Block E of Juan Santamaría. Office hours will be 5 am to 10 pm. “The VIP lounge will provide an important service to our passengers, both those who fly through Avianca- Taca and those who depart from Costa Rica”, said Rodrigo Llaguno, vice president of customer Experience Company. The lounge offers four different environments: a main room, a computer work area free of charge, a restaurant and bar area and a cozy reading. Make sure your costa rica vacation packages include of this, so your airport experience won’t be as tedious as it normally is. In this last room, passengers will have access to various materials such as entertainment and business magazines and national newspapers. In addition, by offering a view of the runway and the hills of the Central Valley mountain range and the dissemination of music during the 17 hours a day, which is open to the public, the VIP room is also a cozy place to rest that will make your costa rica travel conditions a better experience. These benefits are only available to program members’ miles of Avianca-Taca; for those who carry credit card LifeMiles Credomatic or American Express and for those who are traveling in business class in this company. “For Avianca-Taca is very important to be able to realize this strategic alliance with Credomatic to the opening of the VIP room in our hub”, said Llaguno. 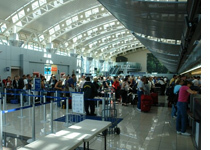 The Juan Santamaría airport expansion last year by the Aeris Costa Rica’s operator allowed Avianca-Taca to have a space to enable its VIP lounge.